Romney, “gifts,” and the 47 percent: What he really thinks about blacks, Hispanics, health care, and birth control. 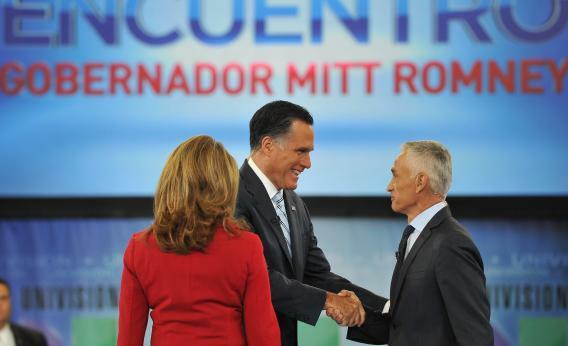 Mitt Romney at the Sept. 19 Univision forum with Latino voters. When you read these quotes and listen to the audio, three patterns sink in. First, everything Romney says on the conference call is the opposite of what he said in the debates. In the debates, Romney pledged to “make it easier for kids to afford college” and bragged that as governor, he had given students “four years tuition free to the college of your choice.” On the call, he depicts college loan assistance as a bribe. In the debates, Romney labeled Obamacare a big-government mandate that would force everyone to buy a product, would cost 20 million people their health insurance, and would raise every family’s premiums by $2,500 a year. On the call, he describes Obamacare as “free health care” worth $10,000 per family. In the debates, Romney claimed that “under my plan … young people are able to stay on their family plan.” On the call, he brushes off this idea as a “gift” used by Obama to buy votes. In the debates, Romney said “every woman in America should have access to contraceptives.” On the call, he caricatures Obama’s policy—that insurance plans must cover birth control for the premium payer—as “free contraceptives” for young women.